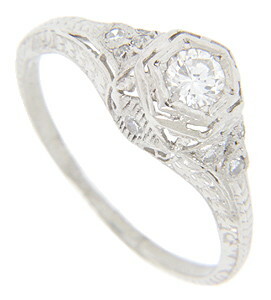 This antique style platinum engagement ring is studded with diamonds. Three diamonds form a crescent over a single diamond on each shoulder while an additional diamond is set in each side of the ring. Intricate engraving provides further ornamentation. The center stone is a .22 carat I color Si2 clarity diamond. 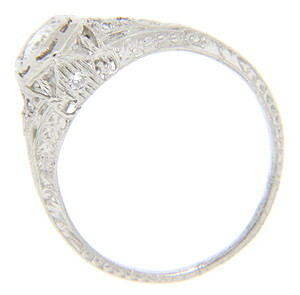 The ring measures 7.3mm in width. Size: 7. We can resize.